What are your greatest dreams? A number of years ago, I took a correspondence course in commercial art. I wanted to be an artist. Later, I took a correspondence course in creative writing. I wanted to be a writer. Another goal I had was to teach "younger women." I wanted to be a public speaker, to speak at women's retreats and conferences. However, I haven't accomplished any of these things to the extent that I hoped and dreamed. Late last night (actually very early this morning), in meditating on a video I recently watched — view it at http://www.Godtube.com/view_video.php?viewkey=8cf08faca5dd9ea45513 — about a father who competed in a triathlon with and for his physically challenged son, I realized something: the picture above of our family captures all my hopes and dreams. 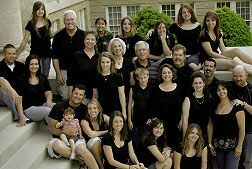 On June 29, 2008, twenty-four members of our family (everyone except our oldest son, Kenn) gathered around Jimmie and me for a family picture. Some in this picture come from broken homes; some have been divorced and then married into our family; some come from unsupportive or difficult family backgrounds. All of us come from "dysfunctional" families because all of us are human. God brought these special people into our lives and empowered Jimmie and me to accept and love them as our own. His love and grace has touched our lives and we reach out to touch the lives of others. He has blessed us so that we can bless others. This family picture is more valuable than the greatest masterpiece ever painted; more poignant than the most eloquent work ever written; more dynamic than any public speech that has ever been spoken. I could never create such a work of art with paint and brush. I could never write a poem, a song, an article or a novel as inspirational. Nor could I make a talk as moving as that picture of our family. God has done for me what I could not do myself. And, God has done it abundantly more beautifully, more powerfully and more meaningfully. Yes, He has given me spiritual and eternal life, but He has also granted my hopes and dreams of this life. God is the Master Artist, Master Writer, Master Speaker — we are merely His instruments. God has done what I could not do! We know that God causes all things to work together for good for those who love Him and who are called according to His purpose (Romans 8:28 NAS). Now to Him who is able to do far more abundantly beyond all that we ask or think, according to the power that works within us, to Him be the glory in the church and in Christ Jesus to all generations forever and ever (Ephesians 3:20-21). "Hopes & Dreams" by Brenda Terrell is licensed under a Creative Commons License. Heartlight encourages you to share this material with others in church bulletins, personal emails, and other non-commercial uses. Please see our Usage Guidelines for more information. Brenda has been married to Jimmie for 48 years. They have 4 children, 15 grandchildren, & 1 great-grandchild. Brenda's hobbies are reading, art, writing devotional articles, poetry, knitting, keeping my grandkids & great-granddaughter, & traveling.